Most art-supply stores sell pre-stretched canvas, but typically only in standard rectangular dimensions. If you wish to create an irregularly-shaped canvas with curves or non-standard angles, you'll have to buy the supplies separately and then stretch your own canvas. Though it will take additional effort and attention to detail, doing a shaped canvas can set your artwork apart from those that rely on the typical canvas framework. Constructing a shaped canvas requires basic carpentry skills and a few simple tools. Draw the desired canvas shape on 3/4-inch plywood. Then, measure 4 inches in from the shape outline and retrace the shape. This will be the canvas framework. Drill a hole through the plywood in the center of the inner drawing. Insert the jig saw blade into the hole and cut around the inner drawing line. Do not cut through the line. Starting from the outside of the shape, use a jig saw to cut around the outside drawing line. Do not cut through the line. Use a medium grit sandpaper to smooth the cut plywood edges of the canvas frame. Cut a section of canvas from the roll, roughly the shape of the plywood frame. Be sure to cut the canvas 4 to 6 inches larger on all sides for stretching purposes. If the canvas is pre-primed, lay that side down on the work surface and place the plywood frame in the center of the canvas. Starting in the middle of the side closest to you, staple the canvas on what will be the back of the plywood frame. Then pull the canvas tight around the side of the frame directly opposite of that first staple. You'll know you've pulled it tight enough if there is a ripple in the canvas. Then secure with a staple on the back of the frame. Rotate the frame a quarter turn and repeat the stretching and stapling process. Keep turning the frame, stretching and stapling the canvas from opposite sides, until the canvas is taut and fully secured on the frame. There should be a minimum of one staple every 2 inches around the frame. Cut any excess canvas from the back of the plywood frame with scissors. The canvas is now ready for painting. 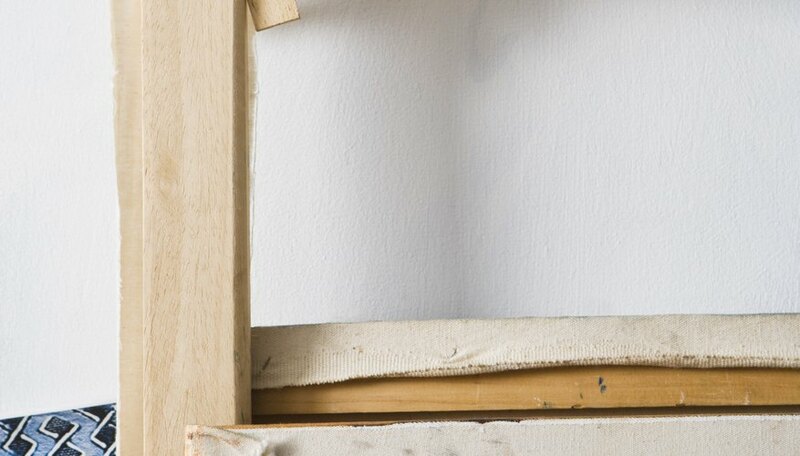 For those who haven't stretched canvas before, it is best to practice on a simple rectangular frame before attempting an irregularly-shaped canvas.